Most feed proteins contain less than 20 g Met kg-1 and 20-50 g Cys kg-1 (MAFF Standing Committee on Tables of Feed Composition, 1990). The microbial protein from the rumen contains levels of Met and Cys slightly over 2% (Storm and 0rskov, 1983; Martin et al., 1996). These proportions are slightly higher than 1.8% (range 1-3.2%) for Met and 1.3% (range 0.9-3.5%) for Cys in the whole body (MacRae et al., 1993), but substantially lower than the 10% of Cys plus Met in the wool. Consequently, deposition of a high proportion of sulphur-containing amino acids into wool results in an imbalance of amino acids for the other tissues, so the efficiency of protein utilization is reduced. Mata et ai, 1995; Rodehutscord et ai, 1999; White et ai, 2000, 2001). It also improves fibre production in Cashmere and Angora goats (Souri et al., 1998a). In Merino sheep, wool growth responded linearly to the levels of the rumen protected Met supplemented from 1 g day-1 up to 5 g day-1 (Mata and Masters, 1999). A regression analysis of the wool growth (g day-1) to the amount of Met supplement (g day :) gave a wool protein : Met ratio of 0.72. In the same experiment a 5 g day-1 live-weight gain was also obtained for each gram of Met supplementation, which was equivalent to about 0.8 g day 1 protein accretion (Agricultural Research Council, 1984). Therefore a total retention of protein in both the body and wool was 1.5 g g-1 of Met supplemented, or 2.6 g N retention g 1 Met N. The amount of Met in this 1.5 g protein can be estimated to be about 0.012 g, so the ratio of retained Met in protein retention to the supplementation is only 0.011. In Angora goats the responses to supplementation of 2.5 g day 1 of rumen-protected Met (containing 0.23 g N) were 0.67 g N increase in mohair plus 1.08 g N in the body (total N retention - mohair N) (Galbraith, 1998). So the ratio of the increased N retention to Met N was 7.6 : 1. Again, the estimated ratio of Met retention to Met supplementation was low at only 0.06. It is clear that the production return, in terms of protein or N retention, from Met supplementation was great, but the efficiency for Met per se was still low. This is partially because some Met is converted into Cys in the body, which has not been included and is discussed later in this chapter, and about 35% of the rumen-protected Met was degraded in the rumen (Muramatsu et al., 1994). The above results demonstrate that when wool growth increases in sheep or goats with Met supplementation this is coupled with increases in whole-body protein accretion and efficiency. Although supplementing with Met provides more substrate Met for protein synthesis, a more potentially important outcome is the consequent increase in the de novo synthesis of Cys from Met through the transsul-phuration pathway. Supplementation with Met also increases the rate of cell division in wool follicles, for example by 37% with a pro vision of extra 2.5 g day-1 Met (Hynd, 1989). Similarly, the rate of protein synthesis in the skin and the expression of some genes in follicles encoding an intermediate filament keratin protein and keratin intermediate filament associated proteins were increased by a jugular infusion of 3 g day-1 of Met for a period of 7 days (Liu et ai, 2000). 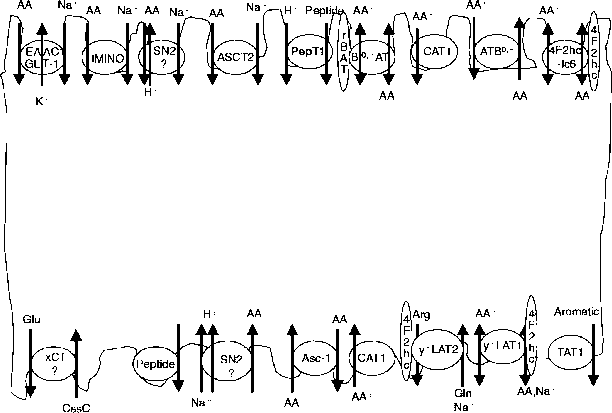 In addition, Met has a role in initiating synthesis of any protein (Glick and Pasternak, 1998), and whole-body protein synthesis was increased with a supplementation of rumen-protected methionine in Japanese goats (Muramatsu et al., 1994). However, supplementing Met to ewes in late pregnancy or early lactation does not result in a significant increase in wool growth rate (Williams et ai, 1978, 1988; Stewart et ai, 1993). In these experiments feed intakes were increased by more than 30% (Williams et ai, 1988) and 35% (Stewart et ai, 1993) to satisfy the nutrient requirements for con-ceptus growth, while maternal body weight was maintained unchanged. Met plus Cys was supplemented at 0.5-1.76 g day 1 (Williams et ai, 1978, 1988) or Met only at 2.9-5.2 g day-1 (Stewart et ai, 1993). Although wool growth rate was not improved, sulphur concentration in the wool was increased by the supplementation, indicating an increased supply of Cys to the wool follicle. The lack of a response in wool growth rate to Met and Cys supplementation is probably due to a change in the relative requirements of the essential amino acids resulting from changes in the types of proteins synthesized and retained. In late pregnancy, the gravid uterus is accumulating approximately 20 g of protein per day with a Met and Cys content similar to that in the whole body (see Table 17.1). Under the circumstances, the proportions of Met and Cys supplied from microbial protein are likely to be sufficient for the combined retention of protein in the gravid uterus and wool fibre. The suggestion that the requirement of Met and Cys, relative to other amino acids, is decreased at this time is further supported by a higher ratio of sulphur-containing amino acids to total essential amino acids in the plasma in late pregnancy and early lactation (Masters et ai, 1993) and an increase in the concentration of sulphur in wool grown during late pregnancy in sheep that were not provided with amino acid supplements (Oddy et al., 1985; Masters et al., 1993). Despite this lack of response to sulphur amino acids, wool growth in ewes in late pregnancy does respond to an increased supply of protein supplied either via the abomasum (Williams et al., 1978) or by protection from degradation in the rumen (Masters et al., 1996).